This gazebo comes in other sizes also. 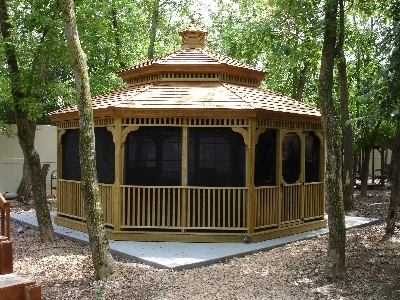 This gazebo has 4-Track tinted window film but can also come without 4-track windows. Made from 40-year tested pressure treated southern yellow pine, cedar shingle roof or 30-year architectural asphalt shingles. Popular options are screens or 4-track windows with screens. The 4-track comes with tinted or clear film, they are easy to use and take care of. The gazebos also come with a screened in floor. Add electric for lights or a ceiling fan. A great accessory is a gas fire pit to add some warmth in the spring, late summer, and early fall.